he only way for a CIO to survive today is by driving revenue growth and customer value with the use of new technologies. Amazon and Netflix, for example, are constantly evaluating new systems of engagement and automation. But how do these technologies apply to your organization? 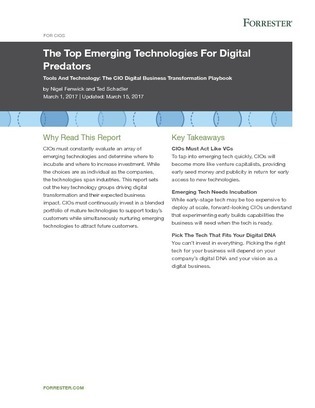 Take a look at this white paper to read about the top emerging technologies that CIOs need to be able to turn into revenue to stay alive, including IoT, containers, security automation, and more.